It’s a Thursday night and I’m, as usual, in McDonald’s, my go-to restaurant before Chris arrives for the weekend. This one is on the Rue St Germain in Paris and I’ve finally given into temptation and tried the Blue Cheese and Bacon Burger, complimented with a caramel sundae (+ complimentary bag of chopped nuts). As I chew on my burger I ruminate on the fact that our Summer 2017: UNESCO trip is coming to an end and over the last three months I have eaten quite a few times in McDonald’s. In fact it’s become a bit of a standing joke. The fad started in Krakow when it was snowing, I was cold, tired and hungry and it was just conveniently ‘there’. 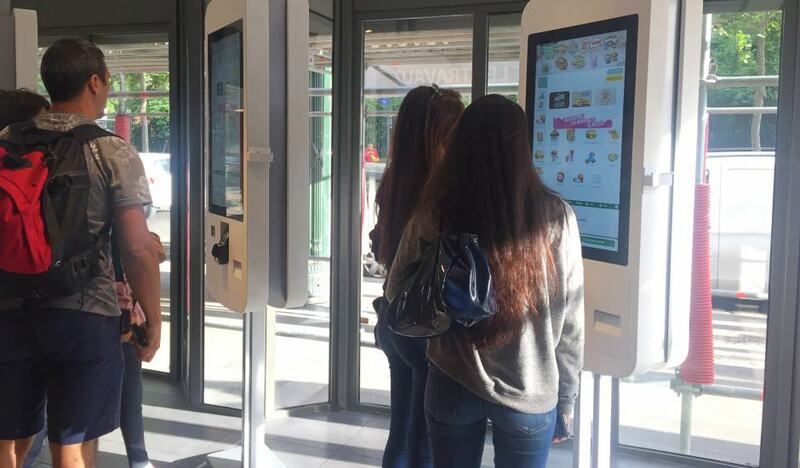 The computer ordering system that looked like huge mobile phones on sticks had me intrigued and so it began. In my defence when you’re alone sometimes it’s just plain easier to go to McDonald’s than to deal with the whole ‘sitting there by yourself at a formal restaurant’ scenario. At McDonald’s no one cares if you’re alone or with a group of 20. 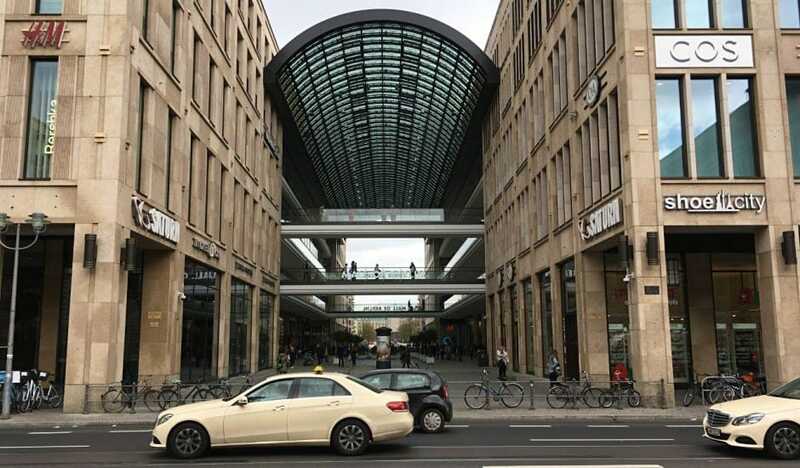 It’s also a guarantee that a city will have a McDonald’s within a few 100 metres walking distance of your hotel or hostel. They’re ubiquitous but that’s also what makes them so darn convenient. 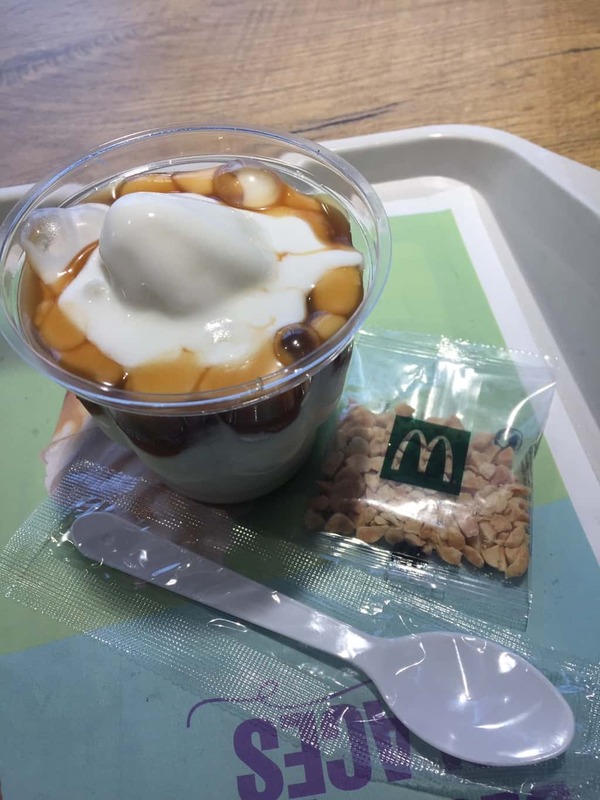 So, without further ado, here are the highs and lows of the 8 McDonald’s I’ve eaten at on our Europe trip (with perhaps some useful insights, who knows!). 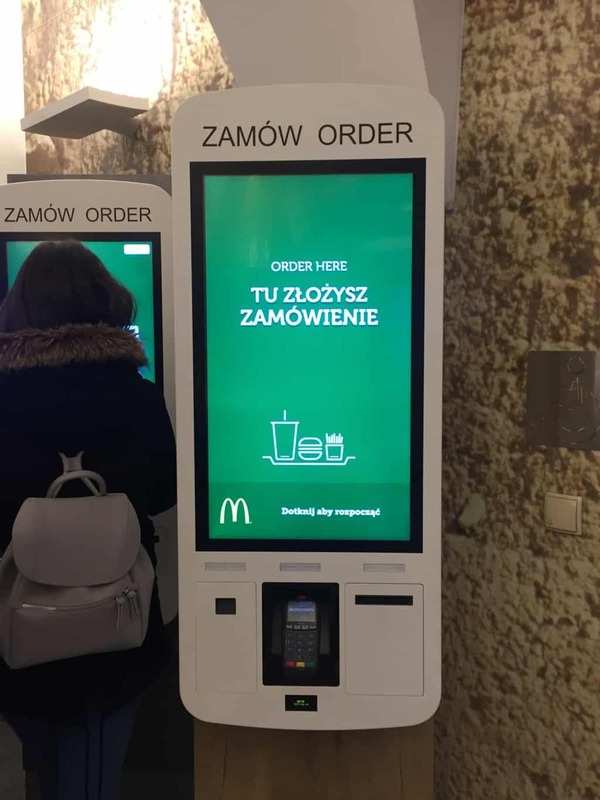 As mentioned above it was snowing and cold and Zulian Aparthotel where I was staying in Krakow didn’t have any nearby restaurants which prompted, somewhat against my inner gourmet, a venture inside MacDonald’s. It felt kind of wrong to be in one when Krakow seemed to have all kinds of yummy local food on offer. But the novelty of the computer ordering system took over and I was soon happily tapping away and printing out the ticket for my order, probably something like Filet-O-Fish, orange juice and fries. I joined a likely looking queue at the counter and waited, and waited. After waiting a long time and not seeing my number show up I finally figured out that I needed to pay first in the pay queue and then wait in the collection queue. Once I had this down pat I was sorted for my next 7 McDonald’s, though the pay/collection system did vary slightly from country to country. Another thing I noticed in Krakow was that the ‘order from the counter’ guy looked extremely bored and there was no one ordering from him. It seemed like a token counter for older people who didn’t like to use the new fangled machines. I sensed his redundancy looming. Since I’d figured out how to use the machine in Krakow I felt confident about ordering in Vienna, and it was just a 10 minute walk from my Thursday night check-in at 25hours Hotel MuseumsQuartier. This time I paid by card so I could join the collection queue straight away. The highlights of this MacDonald’s was the posh chandelier hanging from the ceiling and the delicious strawberry smoothie. I don’t know what they put in it but it was memorable. The walk to and from was also very pleasant with lots of nice shops to peer into. I didn’t think there would be a McDonald’s in Venice but there is one, and it was around a 15 minute walk from San Geremia, the hotel we were using as a base for two consecutive weeks. I went to it twice for the Thursday night rituals and again for Chris’ birthday lunch as I’d raved about the McAngus Wrap. 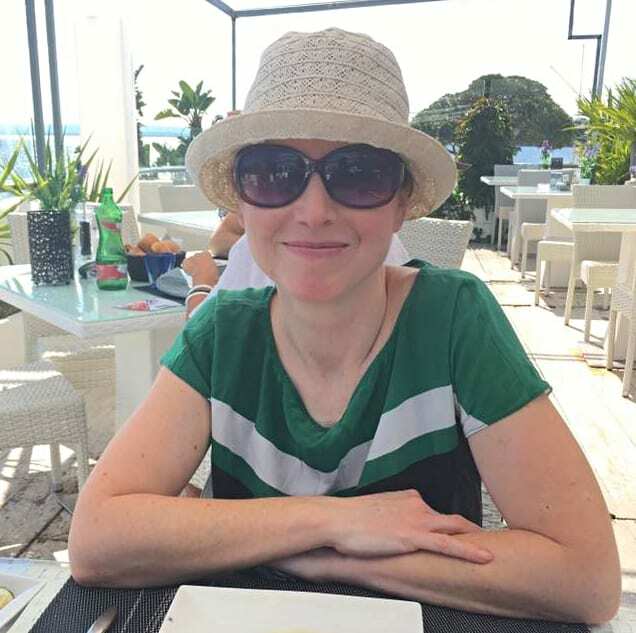 I’d branched out from the Filet-O-Fish on my second Venice meal, having had a sub-par experience on all previous experiences. They’re best when freshly made and oozing with lots of tartare sauce but the ones I’d had were a bit dry and chewy like they’d been sitting there a while. I was surprised that the paying/collection service in Venice was very chaotic. Trays were backed up, the server was flustered and wrong items were being placed on trays. A guy actually made off with my wrap before he was called back and it was placed on my tray. It was meaty though I’ll give them that, hence my recommendation to Chris. I also noticed the rubbish situation was more messy here than anywhere else with the recycle rolling bin not working. Oh and the WiFi wasn’t easily accessible, you had to register for it but who can be bothered doing that? There was also a code for the toilet. When we went for Chris’ birthday he ordered the wrap and got a McAngus Hamburger instead. I think there was something definitely up with the streamlining process at this one. McDonald’s was just a two minute walk from Rodamon Hostel my hostel in Barcelona so it was a no brainer, even though it wasn’t a Thursday night. 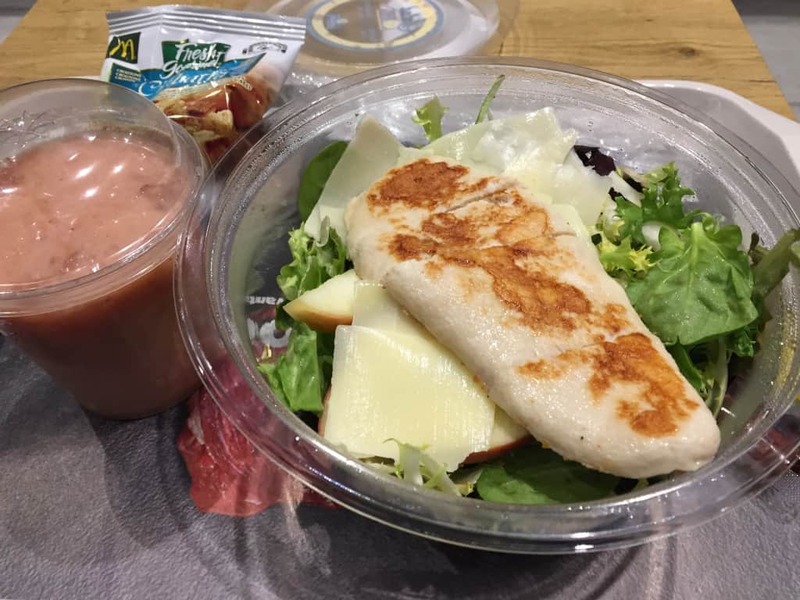 It was hot and humid in Barcelona so what better time to try the healthy McDonald’s salads? I ordered a grilled chicken salad with a fruit smoothie and felt most smug. 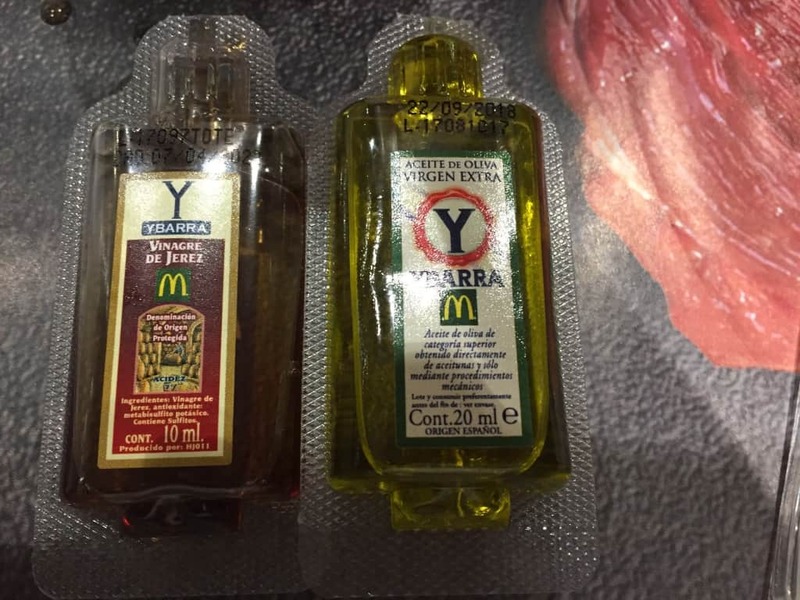 It came with cute little bottles of oil and vinegar, and croutons. After switching to Monrooms on the Thursday I scouted out another McDonald’s, a 13 minute walk away and tried the other salad, the Mediterranean, with pasta and mozzarella. It was surprisingly tasty and you could eat pretty much all of it without having a big bunch of lettuce left in the bottom. 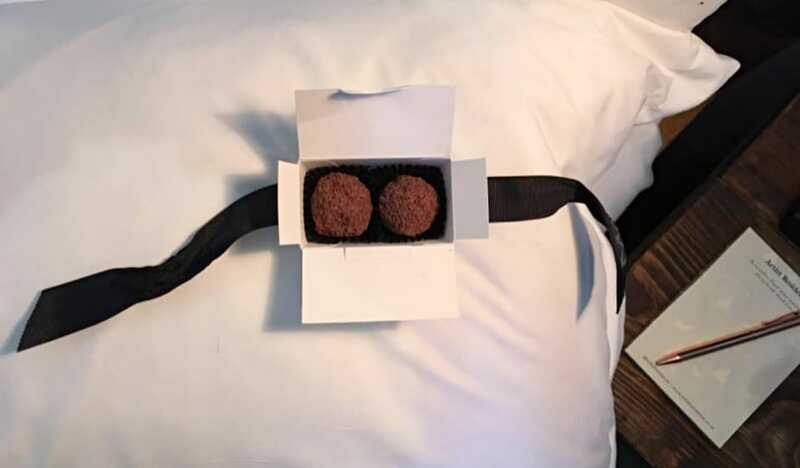 I also ordered a little bag of cherry tomatoes and a fruity yoghurt drink thing which seemed healthy. Ah the Cote d’Azure! So glamorous, so pricey! Since the Hotel du Midi was just a short hop to the McDonald’s at the top of the Avenue Jean Médecin it was easy just to head there. I was beginning to feel vindicated now I’d discovered the salads and that they made a decent meal. Here I pretty much ordered the same meal I had at Barcelona Carrer Gran de Gràcia. On a two day sojourn before meeting up with Chris in Paris I stayed in the town of Reims, known mainly for its Champagne houses, Taittinger, Veuve Clicquot etc. I knew there was a McDonalds in town as I saw the sign for it, sure enough it was six minutes walk from the Hotel Kyriad. 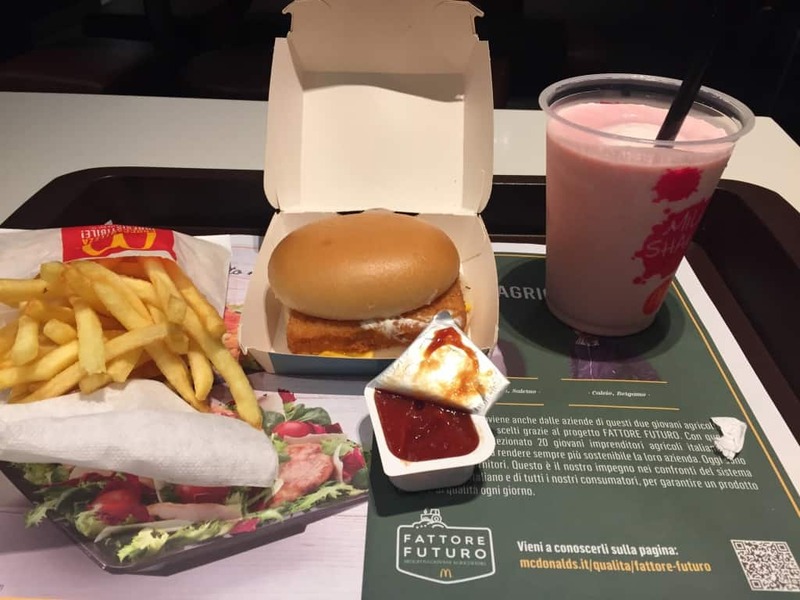 I was feeling a bit nostalgic for a Filet-O-Fish by this time so I ordered one, plus a small salad, some cherry tomatoes and the yoghurty drink thing. When I fronted up to pay the serving girl she looked a bit embarrassed and explained that I could actually have the same things for the price of a Happy Meal, plus a bottle of water, all for €2.50 less. 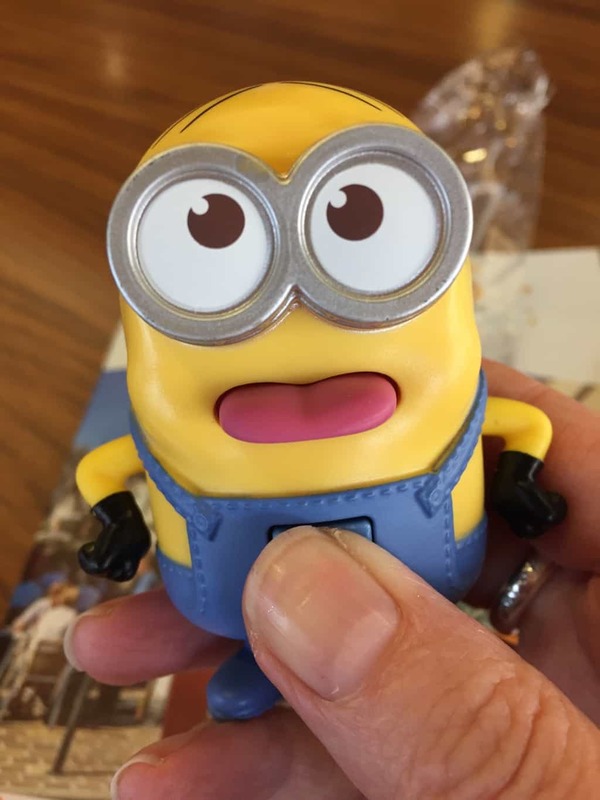 I didn’t care so agreed and then realised when I sat down that it was actually a child’s meal with a Minions toy. I chortled a bit and ate the food. The Filet-O-Fish was dry so I’m glad they didn’t actually give it to a child, it may have done them harm. A small boy was avidly watching me play with the Minions toy so I gave it to him, awww. The McDonald’s in Paris where I end my recurrent Thursday night’s is covered in scaffolding, so not the most ambient of addresses, it’s like a small Pompidou. It’s a 5 minute walk from where we are staying at the Hotel Marignan. 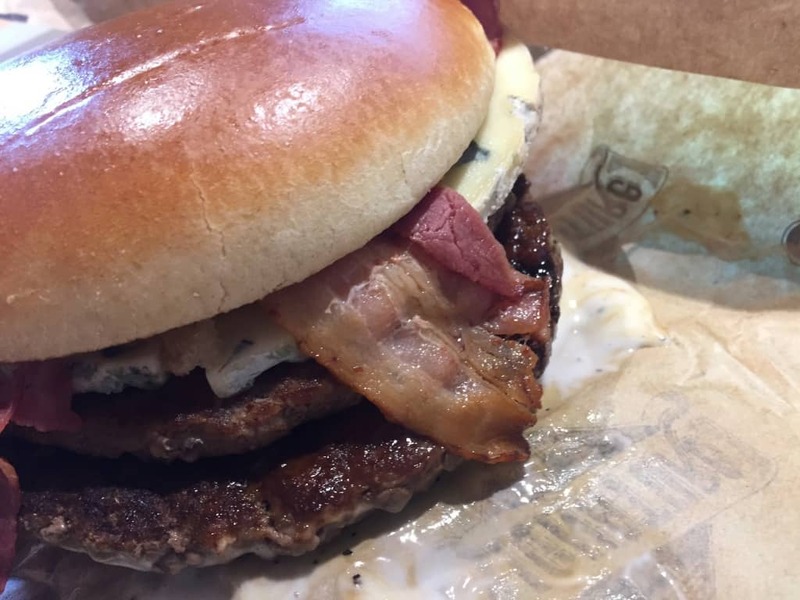 The computers are taken up by millennials so I order my Bacon and Blue Cheese Burger the old fashioned way. He asks if I want ‘one or two meats’ I say ‘one’, but I’m given two anyway. After waiting so long to eat this burger I’m actually a bit underwhelmed. It certainly doesn’t tingle my tastebuds, but the protein is always handy. In conclusion, I have to say I was attracted to eating at McDonald’s because of its very premise, ‘fast and cheap’. But in actuality at times it wasn’t really that fast, in fact it was chaotic. True, the modern touch screen system was fast, but it was so fast the staff making the food out the back couldn’t keep up, like in Venice. Or it resulted in you getting food that had been sitting there a while, hence the chewy filet-o-fish I encountered in several places. It wasn’t really any cheaper either. In Venice, again for example, I paid €8.50 and there were nearby restaurants serving a proper meal for €9 – €10. I wouldn’t say I’d never eat at another McDonald’s on principal, because they do have healthier options now than they used to e.g. wraps and salads. Plus if you are travelling in a foreign country it’s late at night, you’re cold, tired and hungry and everything else is shut, spying the golden arches can be a welcome relief. If that makes me an unwitting participant in McDonalization, then I’m guilty as charged.